The Pocket Theatre Company in our school. 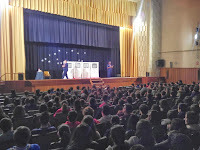 Once again the professionals behind The Pocket Theatre Company came to our school to make us enjoy and laugh with their crazy, creative, daring way of giving us an approach of the greatest playwright Great Britain has ever known, William Shakespeare, and his Much ado about nothing. In spite of the shortness in the casting of actors, their performance was charged with strength and personal voices that far exceeded all expectations. We met Don Pedro, Claudio, Hero, Beatrice, Benedick and the "bad guy" Don John through the generous help of our students. For a short time, we knew about the love - hate feelings surrounding the characters that together with the tricks used in the play introduced us in the world of honour and shame of the XVIIth century. We learnt something else from Shakespeare fictional world with a smile, let´s keep it until next year!